Maybe they lost their job because knowitall tip/service industry/ maven Chesire (sic) Cat whined to the owners. Or maybe they weren’t as good a server as the one we had at a local restaurant the other night. It was her first night on the job, and she was wonderful. We called the Manager over to let him know how well she treated us, and gave her a $20 tip on a $58 check. I guess she hasn’t yet become cynical about patrons, because she was a very nice young lady. We’re going back this weekend, and we really hope she’s our waitress again. Alexis, you were GREAT!!! I hope you get some sorry fired server’s extra shifts!! AAh! “Proud of spitting in food” guy! We missed you on the indoor/outdoor cat thread. They’re taking the glass half full approach a bit too far, don’t you think? I had to read the note three times before I could figure out what they were talking about. I thought they were talking about computer servers. Huh? Time for me to get out a little more. Ugh. OK, glad to see I’m not the only massive nerd. yep that is what I thought too. yeah, computer sever was my first thought also. Why would they “fire” a computer server? And were they leaving a note for the other servers? Can they read? I don’t know much about that part of computers. Maybe they thought it was “set fire to”. Janellionaire – That’s why I read it three times. I couldn’t figure out what they were saying about the computer servers! Thanks to all the other geeks for ‘fessing up too. raises hand Yeah i had to re-re-read it trying to figure out how they had narfed their server. We have a couple we often talk about taking to the gravel pit to shoot… setting them afire would be smelly. I don’t have enough familiarity with servers to feel that strongly about them, but I do know a printer that I’d like to go all “Office Space” on. I’d “fire” that in a heartbeat. I wish Len & Lili wrote obituaries. Good to see a note that’s actually passive-aggressive and not overtly hostile.. love it! This sounds much better if read with an Arnold Schwarzenegger voice. or c) both a and b.
I can easily imagine a situation in which this note would make perfect non-p/a sense! at this rate, the restaurant will be running itself in no time! Keep up the good work…or there will be still more shifts for others. Drop one more won ton and it’s back in the crate! Yeesh. This one’s got that “Heads Will Roll!” vibe. I do wonder about the back story to this. Could be like someone said above a disliked coworker…..and not enough shifts to go around in the first place. Thought that after I realized they weren’t talking about computers. With this kind of good news for people who love bad news I wonder if the shitcanned server even knows that s/he was terminated or if s/he is going to walk in on Saturday night and ask “ooooh, who got fired?” awkward. Terminated? wow! I use terminated when I trample down spiders and roaches with my foot. Of course shoe covered foot. 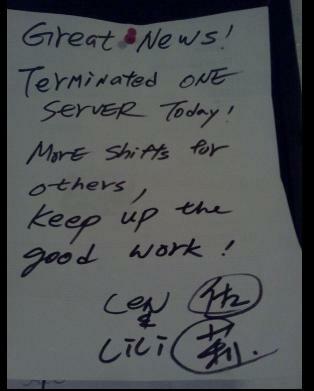 “Terminated one server” Does this mean the rabbit died? Good news – you’re fired. You can sleep in tomorrow. A note similar to this was the inspiration for “Death of a Salesman”. …is the last sentence a veiled threat? If so, then it gives a whole new appreciation for the P.A.-ness of this note! Am I the only one who thinks that a note like this could lead to a “going postal” episode? Len and LiLi sound like the bosses from hell!